We hear every day that more and more jobs are disappearing, yet the technology job sector cannot keep up with the unprecedented demand. So why are women falling behind in this growing career track? When we look at the percentage of STEM bachelor’s degrees awarded to female students for the last two decades, based on NSF statistics, we find there are no gender difference in the bio sciences, the social sciences, or mathematics, and not much of a difference in the physical sciences. Great news for women scientists. The only STEM fields in which men genuinely outnumber women are computer science and engineering. What? Why the stagnant numbers in computer science? At the PhD. level, women have clearly achieved equity in the bio sciences and social sciences, are nearly there (40 percent) in mathematics and the physical sciences, and are “over-represented” in psychology (78 percent). More good news. Again, the only fields in which men greatly outnumber women are computer science and engineering. Why no growth? As I started my research for this blog post, I was pleasantly surprised to find women scientist representation growing in almost all aspects of STEM. And at the same time, disheartened to find my major, computer sciences, is stagnate in growth for women over the past two decades. What’s different in the computer science & engineering aspects of STEM that seem to hold women back? There are many conflicting reports on how our environment and upbringing are sublimely programming women away from engineering and mathematics. We were told from an early age, math and science are for boys. My mother was a pioneer and a strong female leader. She holds a PHD in Biochemistry, served as President for Academic Affairs and Provost at Salem International University. She demanded her daughters rise to any challenge and deliver to the best of our abilities. Never once did I doubt I had amazing talents and just needed to get busy using them. So, is it nature or nurture that helped me stay with STEM? Maybe a little of both. I saw an article recently in the WSJ on Salesforce.com, where CEO Mark Benioff, is focused on ensuring women are represented fairly at every level in his company. Taking proactive steps like SFDC.com, to open doors for women, rings truer to me then the “poor little girl” theories on how to increase female participation in computer science and engineering. The cloud-computing giant is two years into a companywide “women’s surge” in which managers must consider women when filling open positions at every level. They are also examining salaries for every role in the company to ensure women and men are paid equally. And finally, ensuring that women make up at least 30% of attendees at management summits or onstage roles at keynote presentations. With some nurturing at home during early years of development and progress in the corporate landscape leveling the playing field, I believe we are finally set to see an upward trajectory for the last two laggard categories in STEM. Future women engineers can see a world where their hard work and discipline will pay off, a road-map to success if you will. We no longer need to break through the old stereotypes, running faster and jumping higher to be considered half as good as our male counterparts. Instead, there will be fair and equal opportunity for career advancement for women engineers and computer scientists. I would submit some of the best technology leaders today are women. My personal experience afforded me the opportunity to work with several top female technology executives. One of the best leaders I worked for is a power house that broke all the stereotypes, and worked circles around her male counterparts. As I look back and try to understand what propelled these successful women, they all possess some classic traits that are needed in any leadership role. Collaboration. Women are skilled collaborators, able to work with all different people. This is an important quality for any professionals, as cross-departmental collaboration is key. Technology impacts every function in modern business, and those most successful will be able to collaborate with all different teams and individuals. Communication. For many of the same reasons, technologist must also be strong communicators. Communication is an area where many women traditionally excel and it’s an important quality to have. For example, communicating with the sales department may be different from communicating with the IT department. Good technology leaders will be able to speak to everyone. Perspective. Being able to inspire a team and see the big picture are both equally important. A technology leader must be able to not only collect and analyze data but draw meaningful insights and understand what it means for the company. The ability to holistically view a situation is a competitive differentiation for organizations as well as a positive attribute that many women possess. In the past, women had to fight a little harder to push through the barriers that have prevented women from entering STEM, but the tide is turning. In today’s new business paradigm, with a strong technology sector jobs forecast, it’s a perfect time for young women to enter computer science and engineering field. And to help drive this point home, President Donald Trump signed two laws that authorize NASA and the National Science Foundation to encourage women and girls to get into STEM fields. The Inspire Act directs NASA to promote STEM fields to women and girls, and encourage women to pursue careers in aerospace. The law gives NASA three months to present two congressional committees with its plans for getting staff—think astronauts, scientists and engineers—in front of girls studying STEM in elementary and secondary schools. The full name of the law is the Inspiring the Next Space Pioneers, Innovators, Researchers, and Explorers Women Act. The second law is the Promoting Women in Entrepreneurship Act. It authorizes the National Science Foundation to support entrepreneurial programs aimed at women. The stage has been set – go forth future astronauts, scientist, coder girls! Let’s rock the world. AKF often recommends to our clients the adoption of business metric monitoring – the use of high-level user activity or transaction patterns that can often provide early warning of an incident. Business metric monitors will not tell you where or what the problem is, rather they tell you something appears to be abnormal and should be investigated. The early warning aspect can help reduce detection time and thus shorten overall MTTR. At eBay, we had near real time graphs of user metrics such as bids, listings, logins, and new user registrations. The data was graphed week over week. Usage patterns throughout a day followed a readily identifiable pattern with peaks and valleys. These graphs were displayed in the network operations center, which was staffed 24x7. Deviations from the previous week’s pattern had proven useful, identifying issues such as ISP instability in the EU impacting customers trying to access eBay. Everything seemed normal on a Wednesday evening – right up to the point that bids and listings both took a nose dive. The NOC quickly initiated the SEV1 process and technical resources checked their areas. The site had no identifiable faults, services were confirmed to be working fine, yet the user activity was still markedly lower. Roughly 20 minutes into the SEV1 process, the root cause was identified. The finale episode of American Idol was being broadcast. Our site was fine. Our customers had other things on their mind. The business metric monitors worked – they gave warning of an aberrant usage pattern. The World Cup is the most popular football (soccer) event in the world, arguably the most popular sporting event worldwide. Broadcast matches draw huge audiences in the UK and the broadcast is typically aired without commercials until half time. There was a documentary on the UK electrical utility system preparing for a broadcast. As soon as half time commenced, a large proportion of the viewing audience visited the loo and hit the lever on their electric tea kettles. Thankfully, the documentary was about the electric utility and not sewage! The step function increase in load would cause significant problems for the utility, straining its ability to maintain voltage and frequency. The utility had prepared for this situation by staging “peakers” – diesel generators that can be brought online to help serve the increased load. Utility grid stability is akin to a Goldilocks Zone – too much is bad, too little is bad, just right is best. The operations center for the utility did not want to bring the generators on too early or too late. They needed real time information on their customers. The solution was to have a TV tuned to the World Cup broadcast in the operations center, enabling the engineers to stage on generators immediately prior to half time and stage them off as the load increase subsided. Being paid to watch the World Cup was certainly an unintended benefit! How could your company react in a manner like the UK power utility? A sponsored event or viral campaign could overload your systems. Consider using elastic compute in the cloud for your peak demand – the equivalent to the diesel generators use for the World Cup. Scale up for the spikes in demand, then shut it down afterwards. Own the base, rent the peak. Use business metric monitors to detect workload shifts. The Y axis of the AKF Scale Cube (alternatively the Scale Cube or AKF Cube) indicates that growing companies should consider splitting their products along services (verb) or resources (noun) oriented boundaries. A common question we receive is “how granular should one make a services split?” A similar question to this is “how many swim lanes should our application be split into?” To help answer these questions, we’ve put together a list of considerations based on developer throughput, availability, scalability, and cost. By considering these, you can decide if your application should be grouped into a large, monolithic codebases or split up into smaller individual services and swim lanes. You must also keep in mind that splitting too aggressively can be overly costly and have little return for the effort involved. Companies with little to no growth will be better served focusing their resources on developing a marketable product than by fine tuning their service sizes using the considerations below. 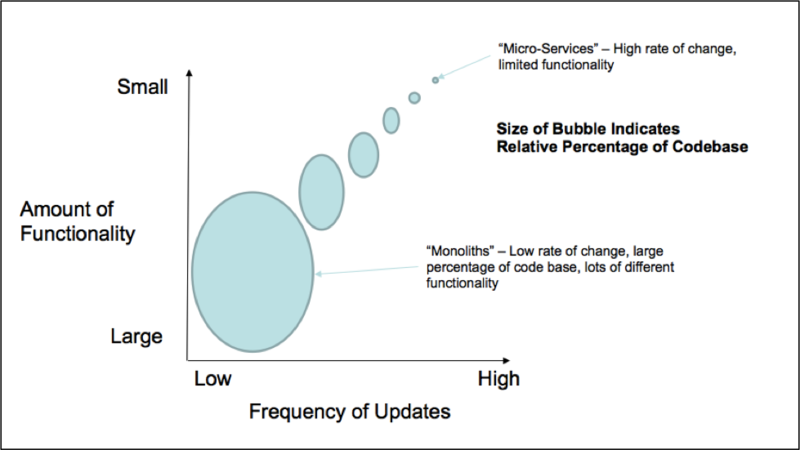 Frequency of Change – Services with a high rate of change in a monolithic codebase cause competition for code resources and can create a number of time to market impacting conflicts between teams including product merge conflicts. Such high change services should be split off into small granular services and ideally placed in their own fault isolative swim lane such that the frequent updates don’t impact other services. Services with low rates of change can be grouped together as there is little value created from disaggregation and a lower level of risk of being impacted by updates. The diagram below illustrates the relationship we recommend between functionality, frequency of updates, and relative percentage of the codebase. Your high risk, business critical services should reside in the upper right portion being frequently updated by small, dedicated teams. The lower risk functions that rarely change can be grouped together into larger, monolithic services as shown in the bottom left. Degree of Reuse – If libraries or services have a high level of reuse throughout the product, consider separating and maintaining them apart from code that is specialized for individual features or services. A service in this regard may be something that is linked at compile time, deployed as a shared dynamically loadable library or operate as an independent runtime service. Team Size – Small, dedicated teams can handle micro services with limited functionality and high rates of change, or large functionality (monolithic solutions) with low rates of change. This will give them a better sense of ownership, increase specialization, and allow them to work autonomously. Team size also has an impact on whether a service should be split. The larger the team, the higher the coordination overhead inherent to the team and the greater the need to consider splitting the team to reduce codebase conflict. In this scenario, we are splitting the product up primarily based on reducing the size of the team in order to reduce product conflicts. Ideally splits would be made based on evaluating the availability increases they allow, the scalability they enable or how they decrease the time to market of development. Specialized Skills – Some services may need special skills in development that are distinct from the remainder of the team. You may for instance have the need to have some portion of your product run very fast. They in turn may require a compiled language and a great depth of knowledge in algorithms and asymptotic analysis. These engineers may have a completely different skillset than the remainder of your code base which may in turn be interpreted and mostly focused on user interaction and experience. In other cases, you may have code that requires deep domain experience in a very specific area like payments. Each of these are examples of considerations that may indicate a need to split into a service and which may inform the size of that service. Desired Reliability – If other functions can afford to be impacted when the service fails, then you may be fine grouping them together into a larger service. Indeed, sometimes certain functions should NOT work if another function fails (e.g. one should not be able to trade in an equity trading platform if the solution that understands how many equities are available to trade is not available). However, if you require each function to be available independent of the others, then split them into individual services. Criticality to the Business – Determine how important the service is to business value creation while also taking into account the service’s visibility. One way to view this is to measure the cost of one hour of downtime against a day’s total revenue. If the business can’t afford for the service to fail, split it up until the impact is more acceptable. Risk of Failure – Determine the different failure modes for the service (e.g. a billing service charging the wrong amount), what the likelihood and severity of each failure mode occurring is, and how likely you are to detect the failure should it happen. The higher the risk, the greater the segmentation should be. Scalability of Data – A service may be already be a small percentage of the codebase, but as the data that the service needs to operate scales up, it may make sense to split again. 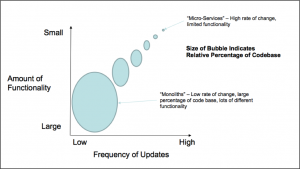 Scalability of Services – What is the volume of usage relative to the rest of the services? For example, one service may need to support short bursts during peak hours while another has steady, gradual growth. If you separate them, you can address their needs independently without having to over engineer a solution to satisfy both. Dependency on Other Service’s Data – If the dependency on another service’s data can’t be removed or handled with an asynchronous call, the benefits of disaggregating the service probably won’t outweigh the effort required to make the split. Effort to Split the Code – If the services are so tightly bound that it will take months to split them, you’ll have to decide whether the value created is worth the time spent. You’ll also need to take into account the effort required to develop the deployment scripts for the new service. Shared Persistent Storage Tier – If you split off the new service, but it still relies on a shared database, you may not fully realize the benefits of disaggregation. Placing a readonly DB replica in the new service’s swim lane will increase performance and availability, but it can also raise the effort and cost required. 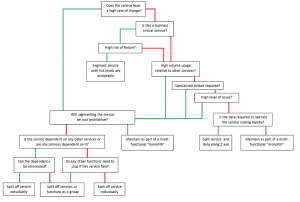 Network Configuration – Does the service need its own subdomain? Will you need to make changes load balancer routing or firewall rules? Depending on the team’s expertise, some network changes require more effort than others. Ensure you consider these changes in the total cost of the split. 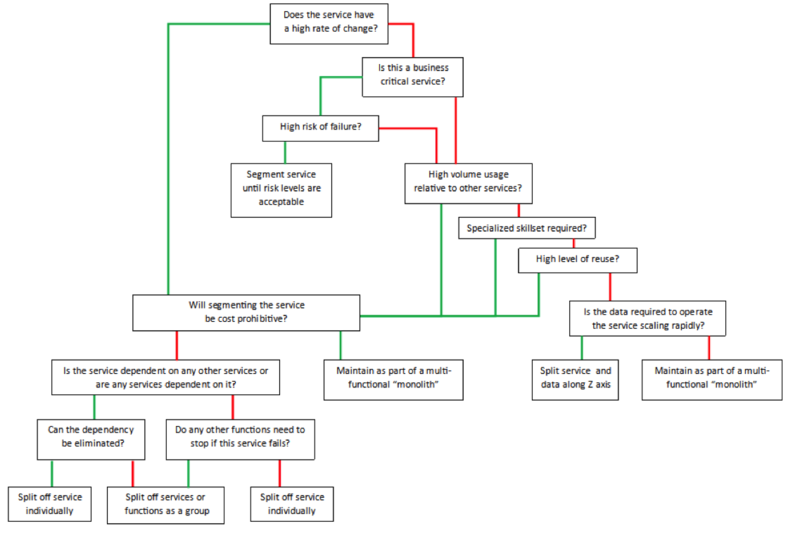 The illustration below can be used to quickly determine whether a service or function should be segmented into smaller microservices, be grouped together with similar or dependent services, or remain in a multifunctional, infrequently changing monolith. Most internet enabled products start their life as a single application running on an appserver or appserver/webserver combination and potentially communicating with a database. Many if not all of the functions are likely to exist within a monolithic application code base making use of the same physical and virtual resources of the system upon which the functions operate: memory, cpu, disk, network interfaces, etc. Potentially the engineers have the forethought to make the system highly available by positioning a second application server in the mix to be used in the event that the first application server fails. This monolithic design will likely work fine for many sites that receive low levels of traffic. However, if the product is very successful and receives wide and fast adoption user perceived response times are likely to significantly degrade to the point that the product is almost entirely unusable. At some point, the system will likely even fail under the load as the inbound request rate is significantly greater than the processing power of the system and the resulting departure rate of responses to requests. A great engineering team will think about how to scale their platform well in advance of such a catastrophic failure. 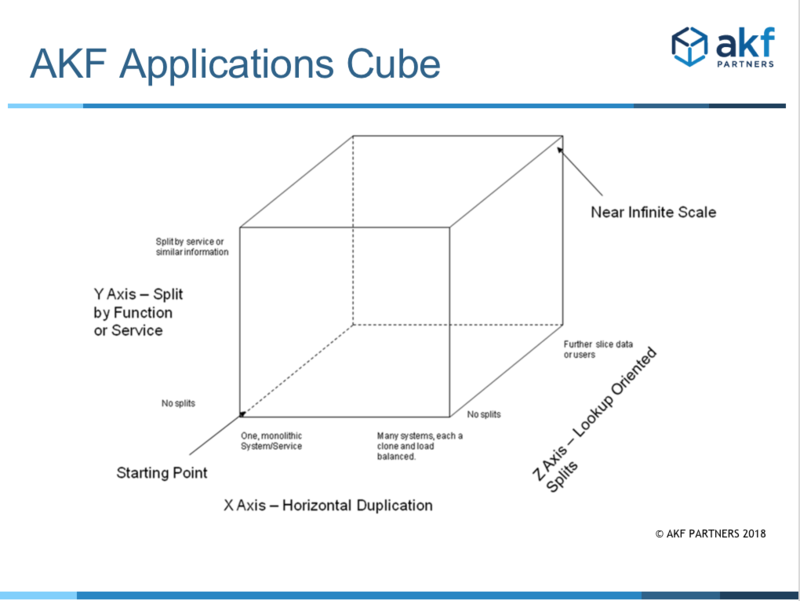 There are many ways to approach how to think about such scalability of a platform and we present several through a representation of a three dimensional cube addressing three approaches to scale that we call the AKF Scale Cube. 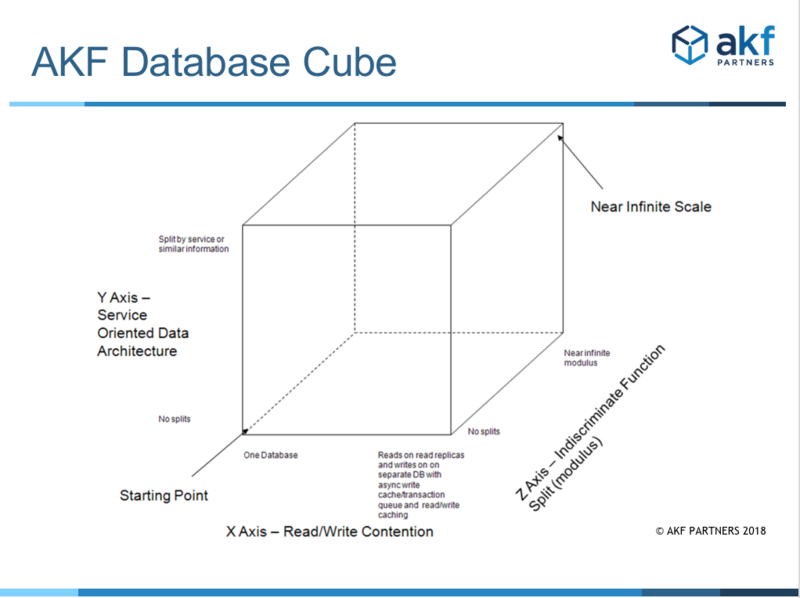 The AKF Scale Cube (aka Scale Cube and AKF Cube) consists of an X, Y and Z axes – each addressing a different approach to scale a service. The lowest left point of the cube (coordinates X=0, Y=0 and Z=0) represents the worst case monolithic service or product identified above: a product wherein all functions exist within a single code base on a single server making use of that server’s finite resources of memory, cpu speed, network ports, mass storage, etc. The X Axis of the cube represents a means of spreading load across multiple instances of the same application and data set. This is the first approach most companies use to scale their services and it is effective in scaling from a request per second perspective. Oftentimes it is sufficient to handle the scale needs of a moderate sized business. The engineering cost of such an approach is low compared to many of the other options as no significant rearchitecting of the code base is required unless the engineering team needs to eliminate affinity to a specific server because the application maintains state. The approach is simple: clone the system and service and allow it to exist on N servers with each server handling 1/Nth the total requests. Ideally the method of distribution is a loadbalancer configured in a highly available manner with a passive peer that becomes active should the active peer fail as a result of hardware or software problems. We do not recommend leveraging roundrobin DNS as a method of load balancing. If the application does maintain state there are various ways of solving this including a centralized state service, redesigning for statelessness, or as a last resort using the load balancer to provide persistent connections. While the Xaxis approach is sufficient for many companies and distributes the processing of requests across several hosts it does not address other potential bottlenecks like memory constraints where memory is used to cache information or results. (caching, etc) for most transactions and also reduces the amount of stabile storage to which the device/service needs attach. In this case, you might try a modulus by content id (article), or listing id, or a hash from the received IP address, etc. The Z axis split is often the most costly of all splits and we only recommend it for clients that have hypergrowth or very high rates of transaction. It should only be used after a company has implemented a very granular split along the Y axis. That said, it also can offer the greatest degree of scalability as the number of “swimlanes within swimlanes” that it creates is virtually limitless. For instance, if a company implements a Z axis split as a modulus of some transaction id and the implementation is a configurable number “N”, then N can be 10, 100, 1000, etc and each order of magnitude increase in N creates nearly an order of magnitude of greater scale for the company. As a frequent technology writer I often find myself referring to the method or process that teams use to produce software. The two terms that are usually given for this are software development life cycle (SDLC) and product development life cycle (PDLC). The question that I have is are these really interchangeable? I don’t think so and here’s why. Wikipedia, our collective intelligence, doesn’t have an entry for PDLC, but explains that the product life cycle has to do with the life of a product in the market and involves many professional disciplines. According to this definition the stages include market introduction, growth, mature, and saturation. This really isn’t the PDLC that I’m interested in. Under new product development (NDP) we find a defintion more akin to PDLC that includes the complete process of bringing a new product to market and includes the following steps: idea generation, idea screening, concept development, business analysis, beta testing, technical implementation, commercialization, and pricing. Under SDLC, Wikipedia doesn’t let us down and explains it as a structure imposed on the development of software products. In the article are references to multiple different models including the classic waterfall as well as agile, RAD, and Scrum and others. In my mind the PDLC is the overarching process of product development that includes the business units. 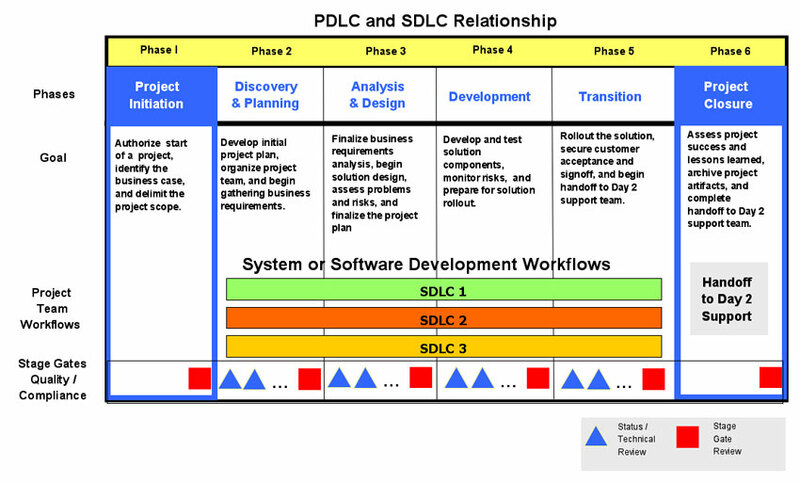 The SDLC is the specific steps within the PDLC that are completed by the technical organization (product managers included). An image on HBSC’s site that doesn’t seem to have any accompanying explanation depicts this very well graphically. Another way to explain the way I think of them is to me all professional software projects are products but not all product development includes software development. See the Venn diagram below. 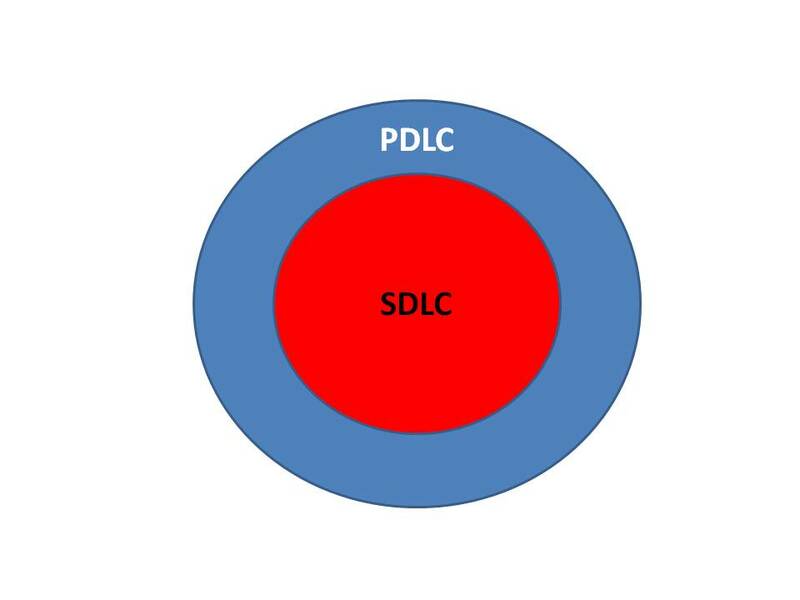 The upfront (bus analysis, competitive analysis, etc) and back end work (infrastructure, support, depreciation, etc) are part of the PDLC and are essential to get the software project created in the SDLC out the door successfully. There are non-software related products that still require a PDLC to develop. Do you use them interchangeably? What do you think the differences are? When Eric Ries used the term for the first time he described it as: A Minimum Viable Product is that version of a new product which allows a team to collect the maximum amount of validated learning about customers with the least effort.